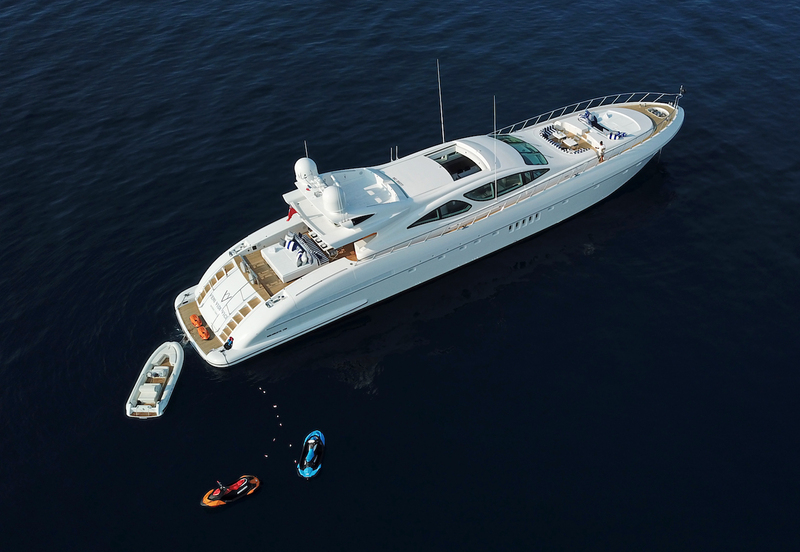 Mangusta 130 (Overmarine) motor yacht Veni Vidi Vici is a 39,62 meter (130 feet) open style performance charter yacht, launched in 2006 and beautifully refitted in 2018. 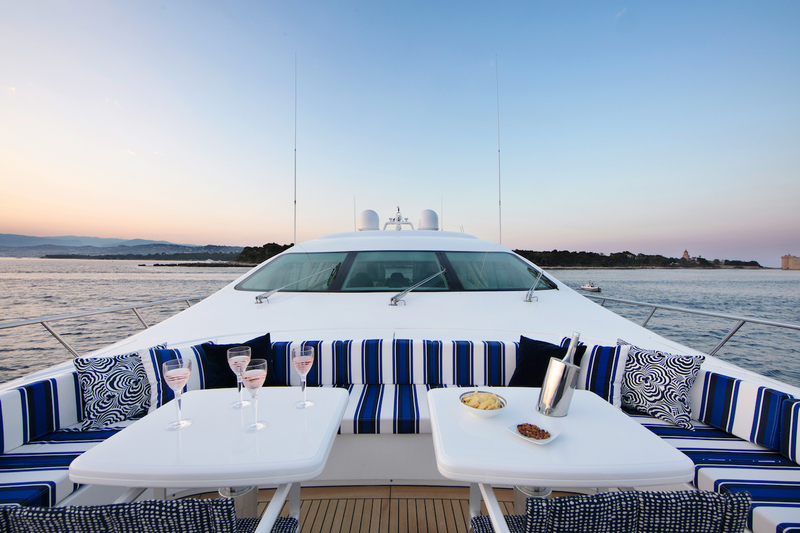 This Mangusta 130 is available for luxury yacht charters in the Mediterranean area and can accommodate 11 guests as a maximum for sleeping purposes in 4 double cabins and one 1 twin cabin with Pullmans, and can host up to 12 guests when cruising. 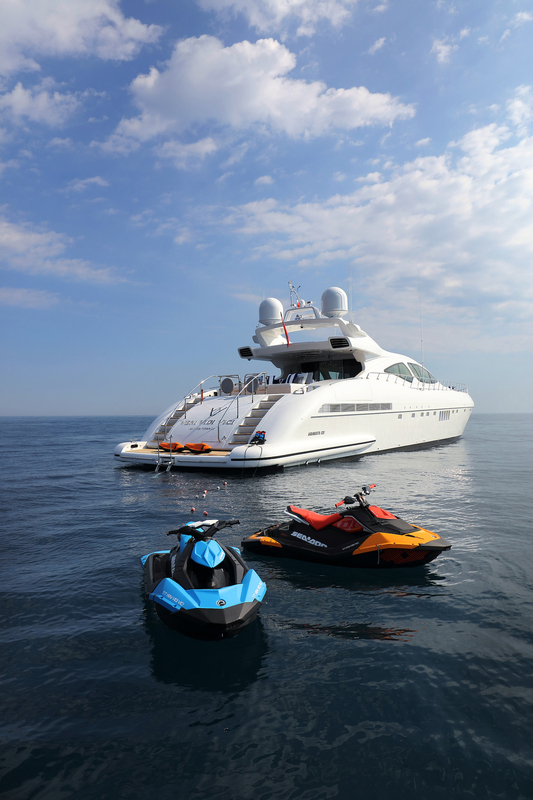 She has a crew of six on board. 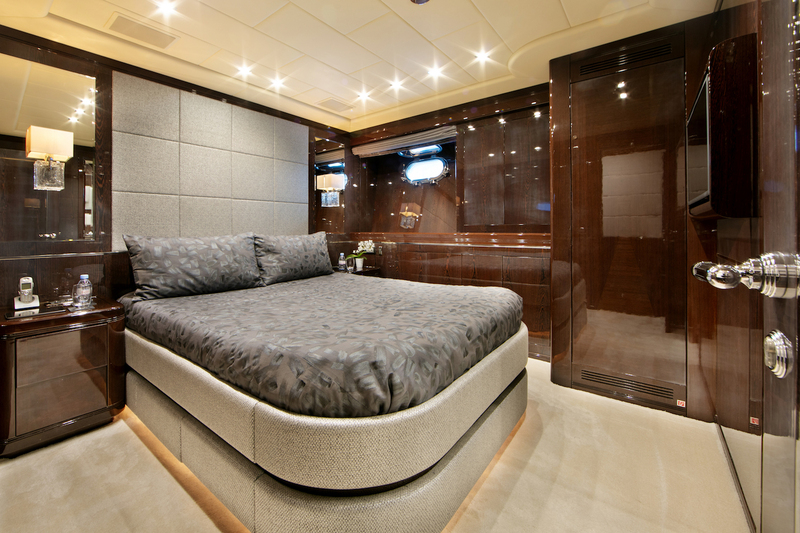 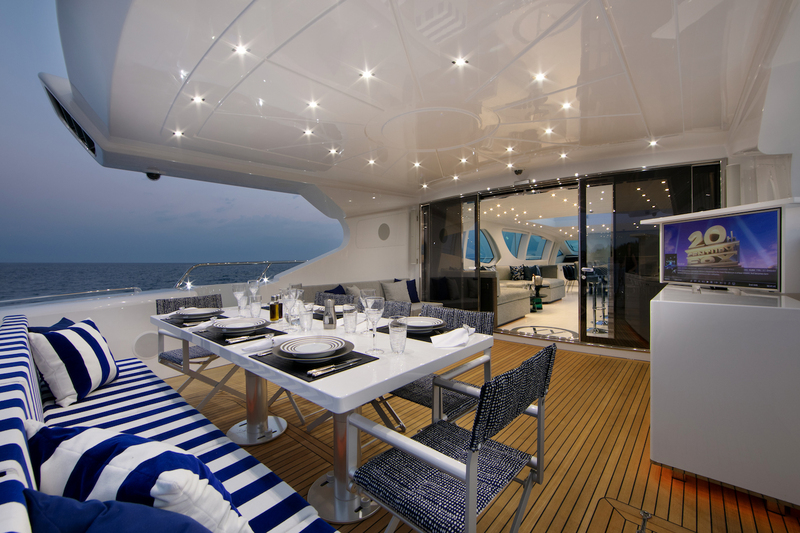 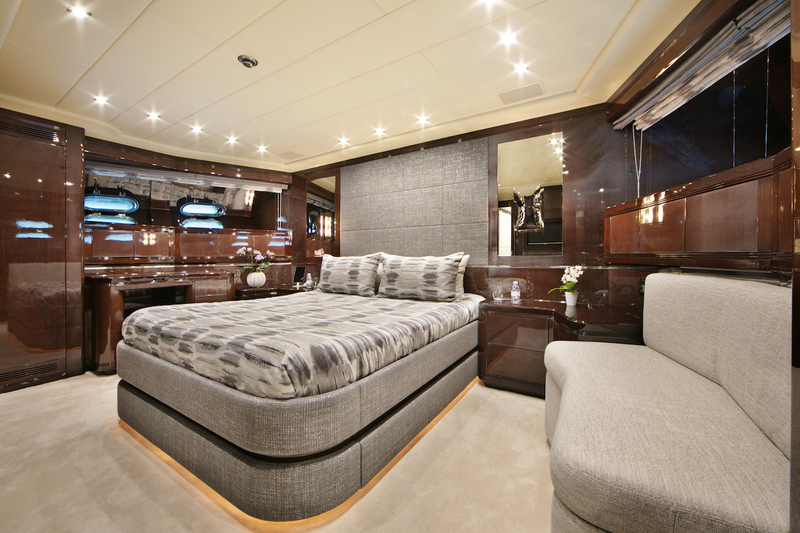 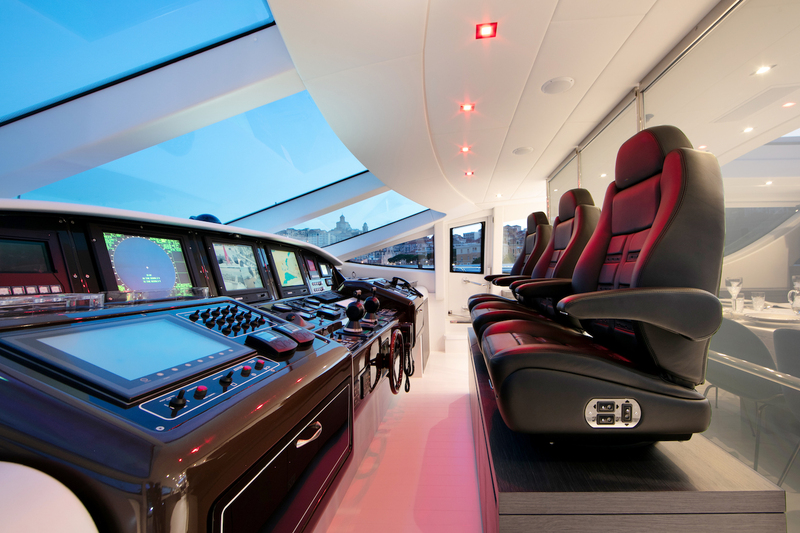 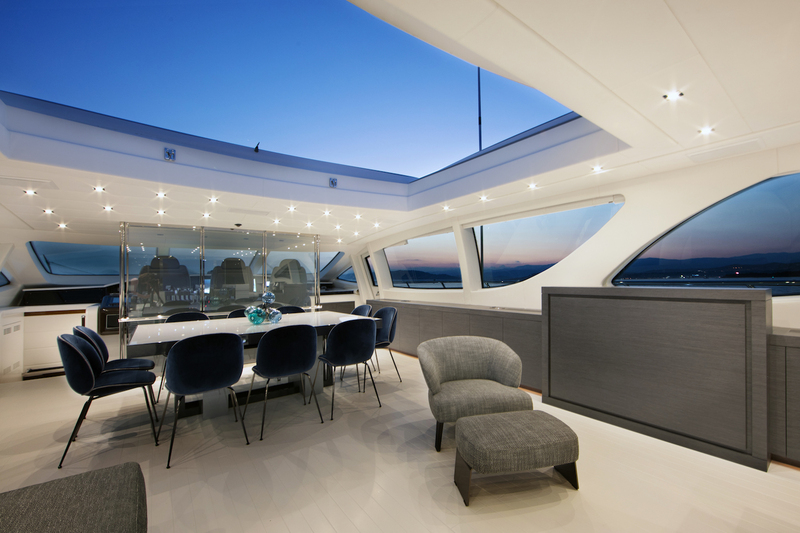 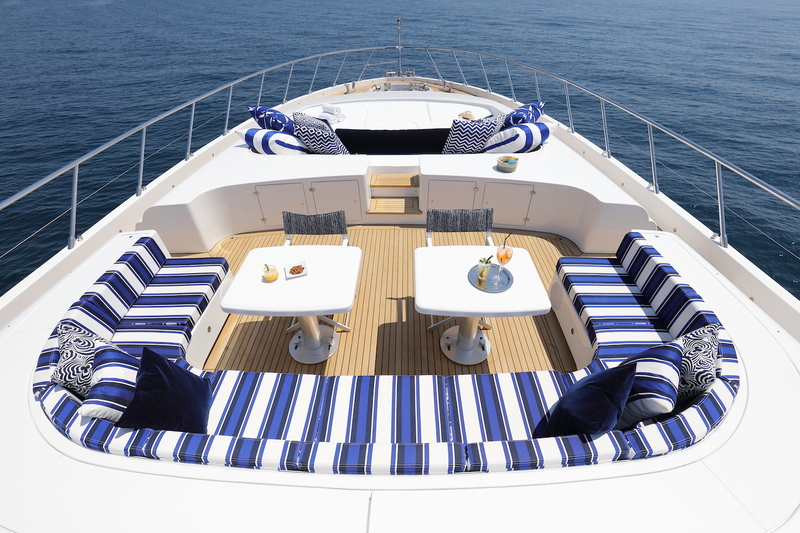 The charter yacht also has a ‘nightclub’ organisation on board for up to 100 guests for on deck gatherings. 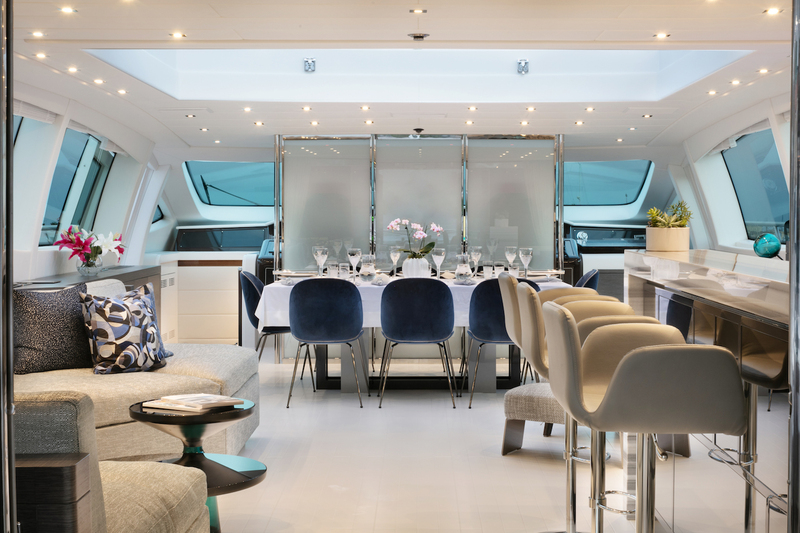 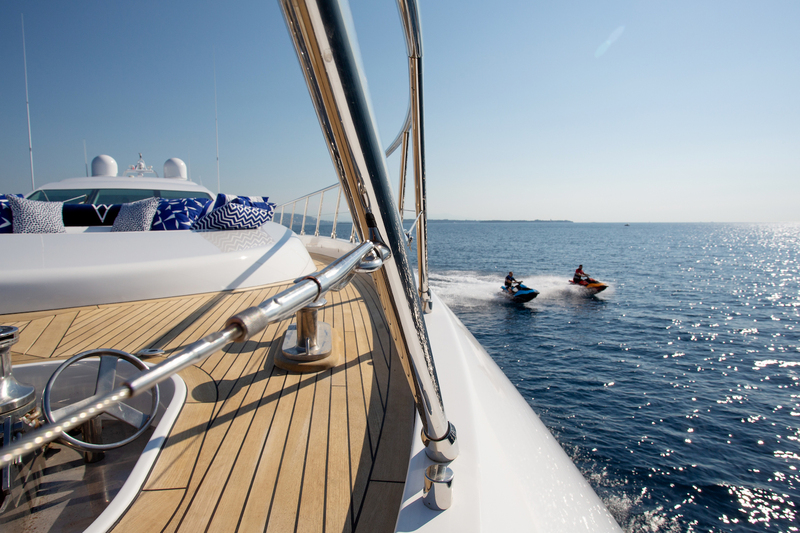 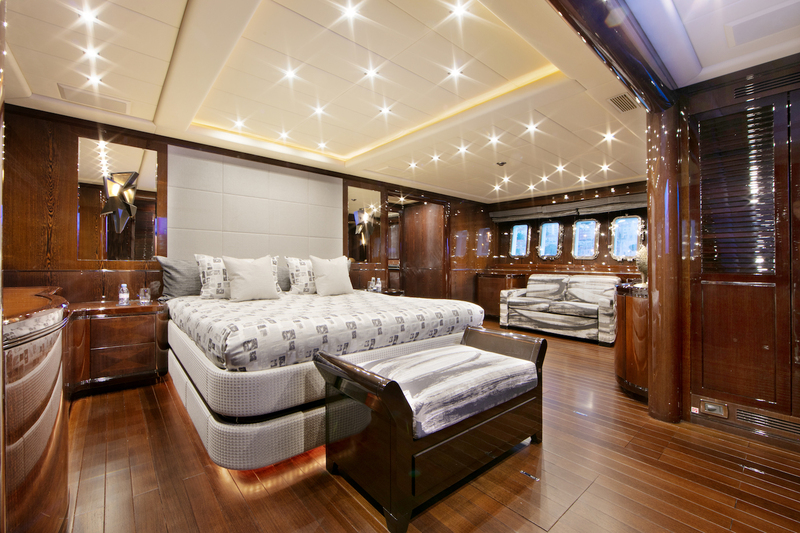 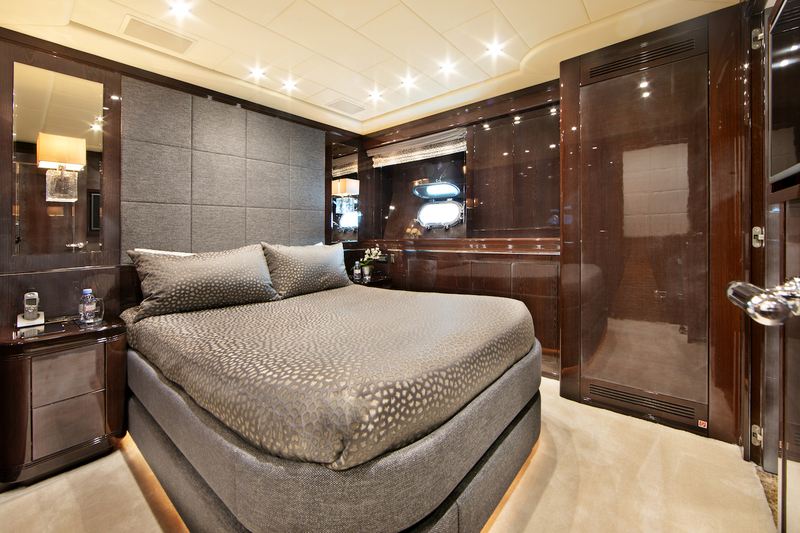 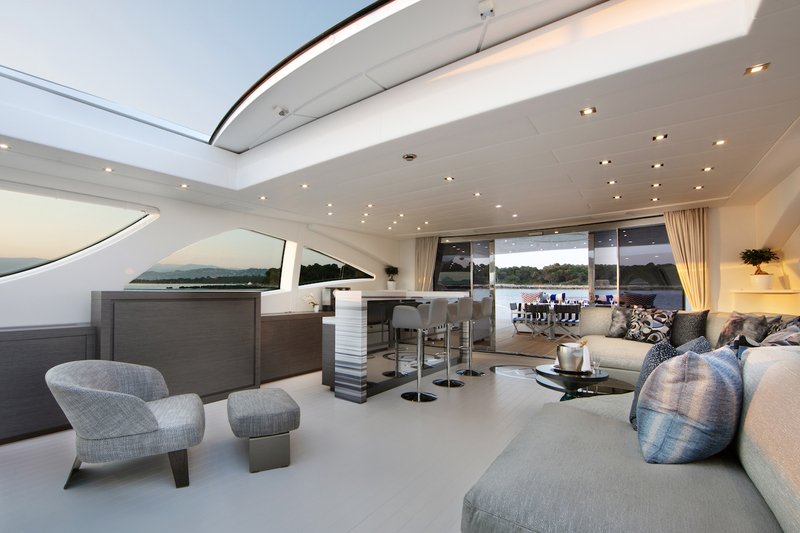 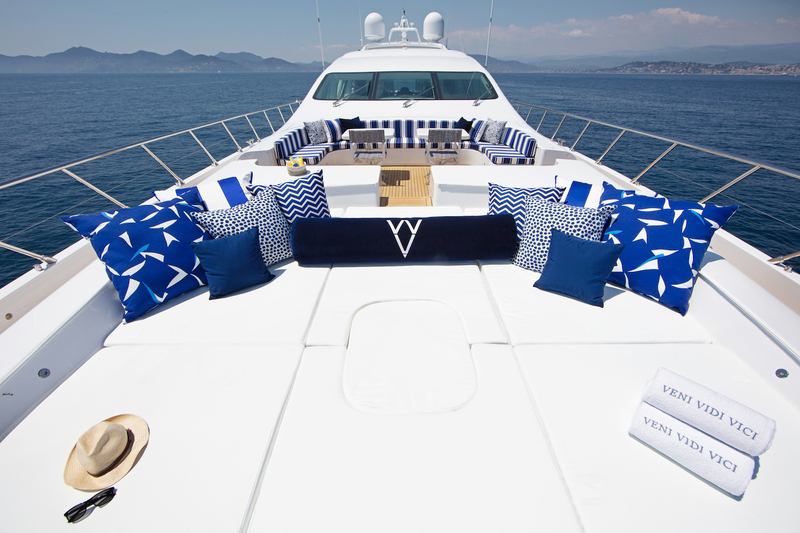 Ideal for fast cruising around the French Riviera, St Tropez, Italy and Sardinia Veni Vidi Vici provides a rich interior layout with lavish and stylish furnishings. 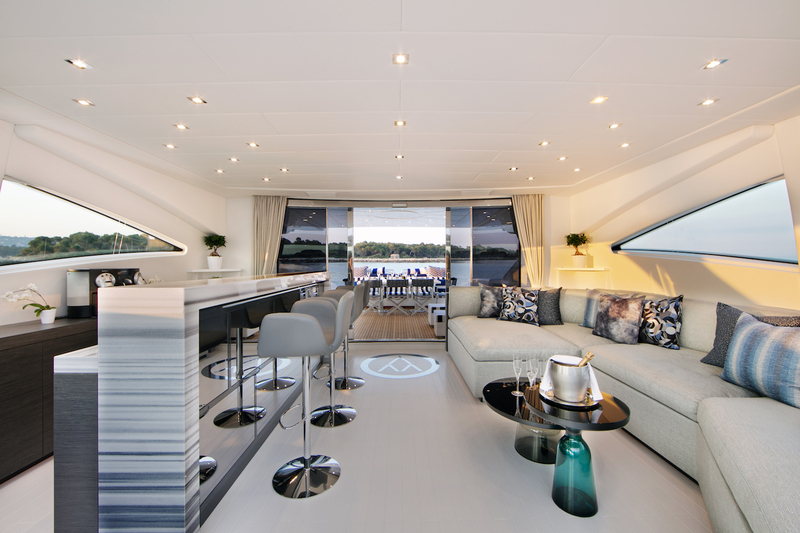 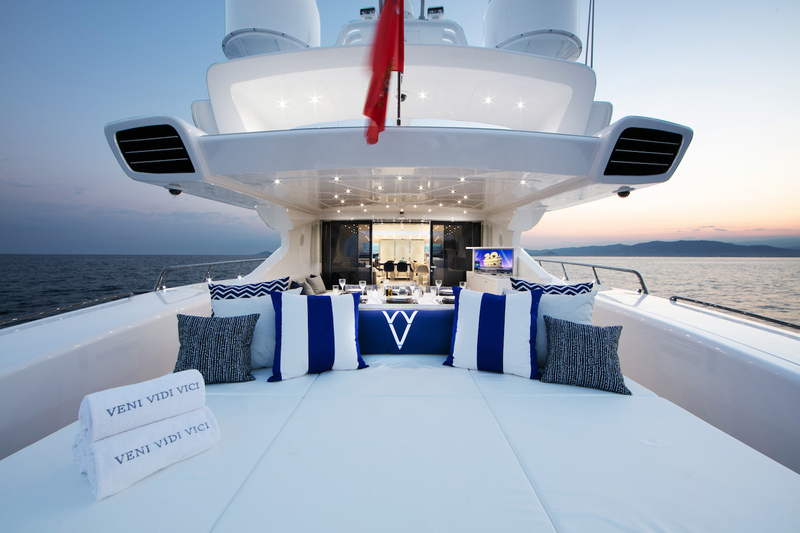 With a chic interior, some of the finest outside entertaining spaces found on any yacht, VVV offers a wonderful charter package. 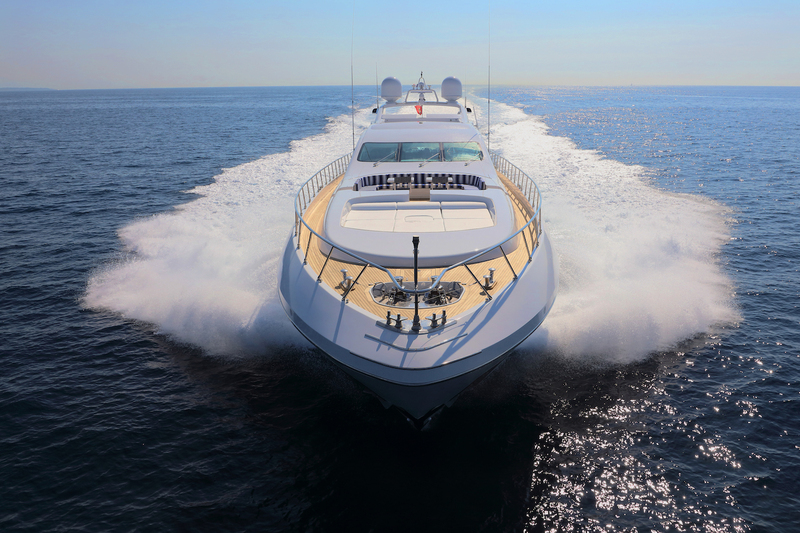 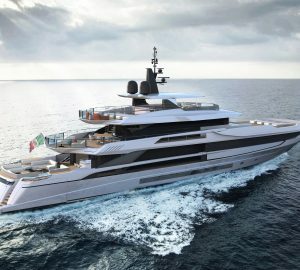 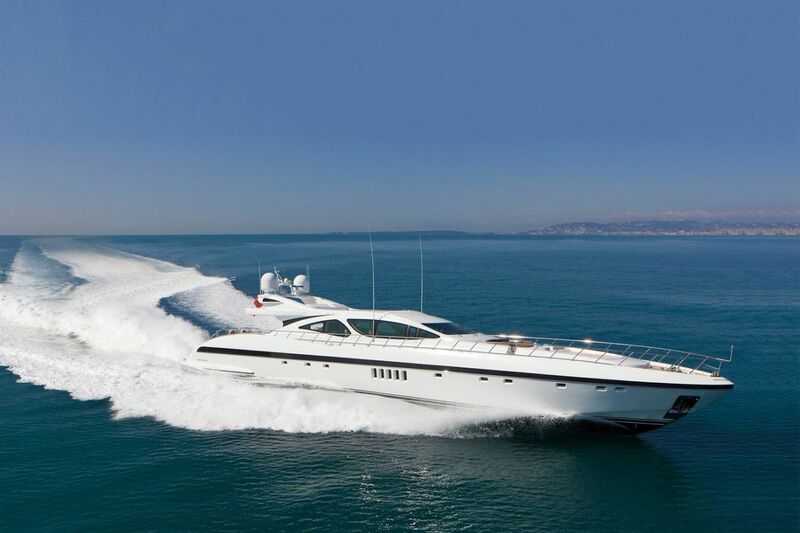 This Mangusta 130 motor yacht, with her 2 x MTU 16V4000 M90 3750hp diesel powered water jet engines, gives a top speed of around 38 knots and a cruising speed of 34 knots. 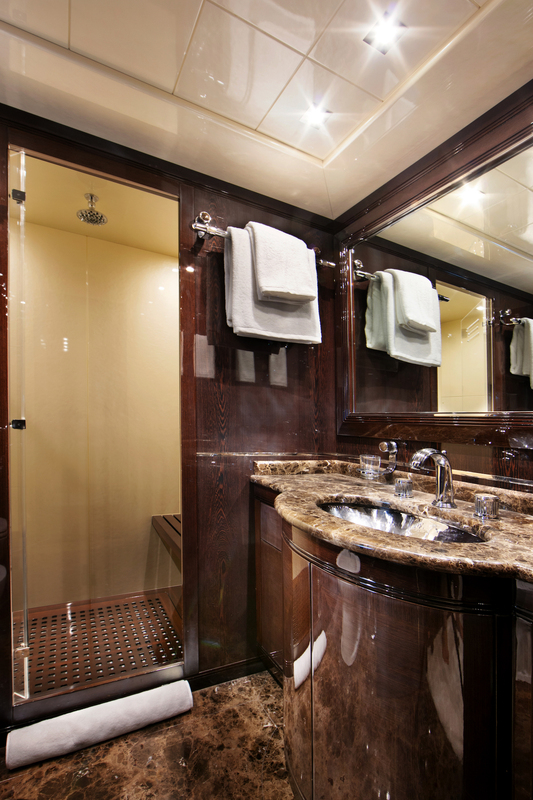 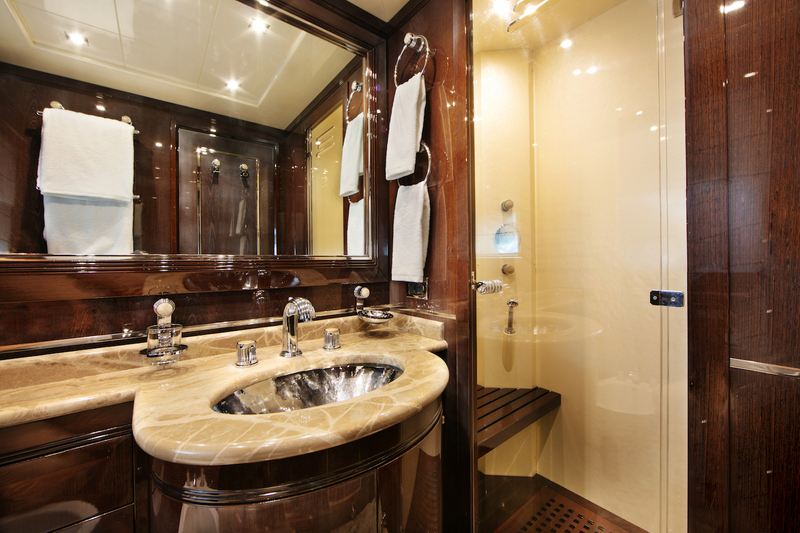 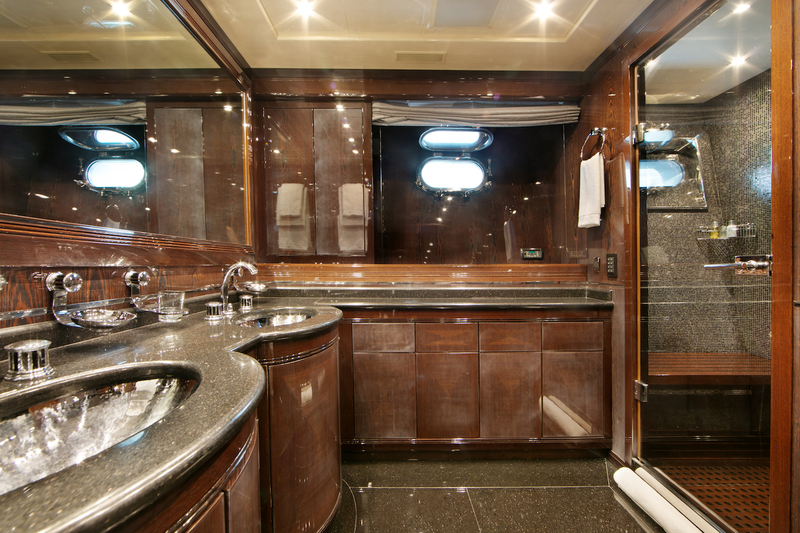 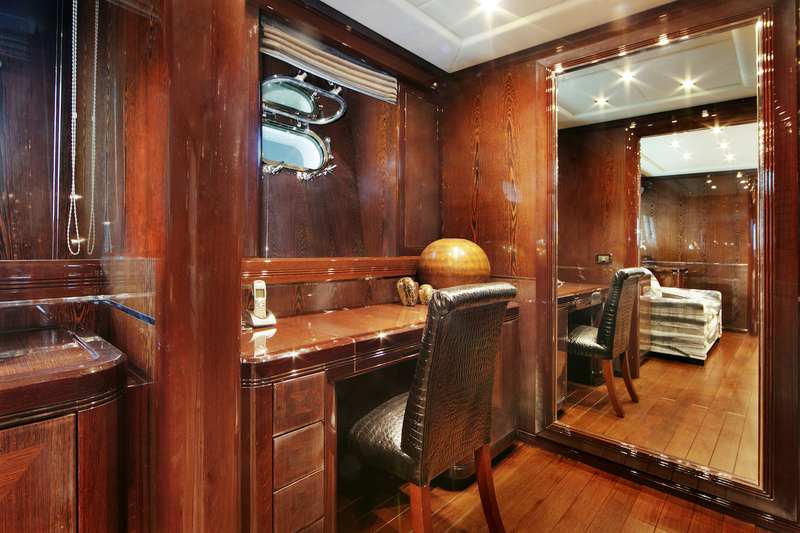 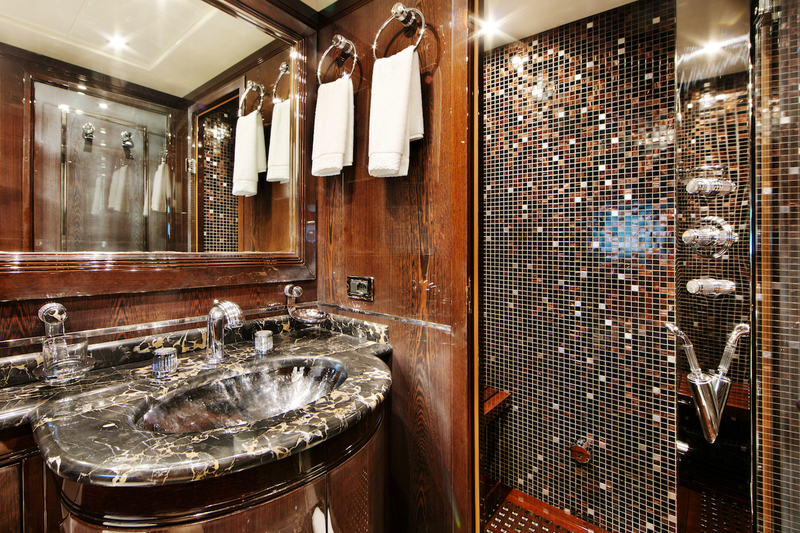 VENI VIDI VICI offers accommodation in five beautifully appointed cabins, each with its own bathroom en-suite. 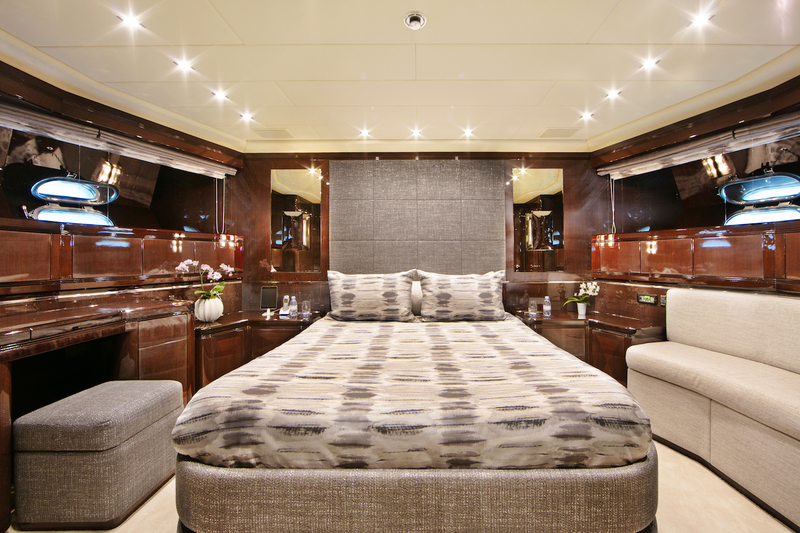 There are four doubles and one quadruple two single beds and two Pullmans/Bunks. 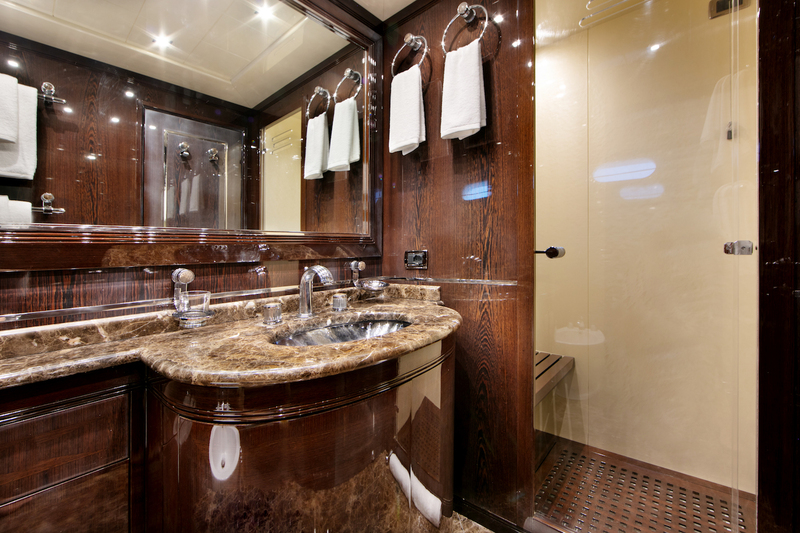 A fridge and a tv plasma in each cabin, Kaleidescape ( 3000 films and 5000 music ) and there are also a Hammam in master and VIP cabins. 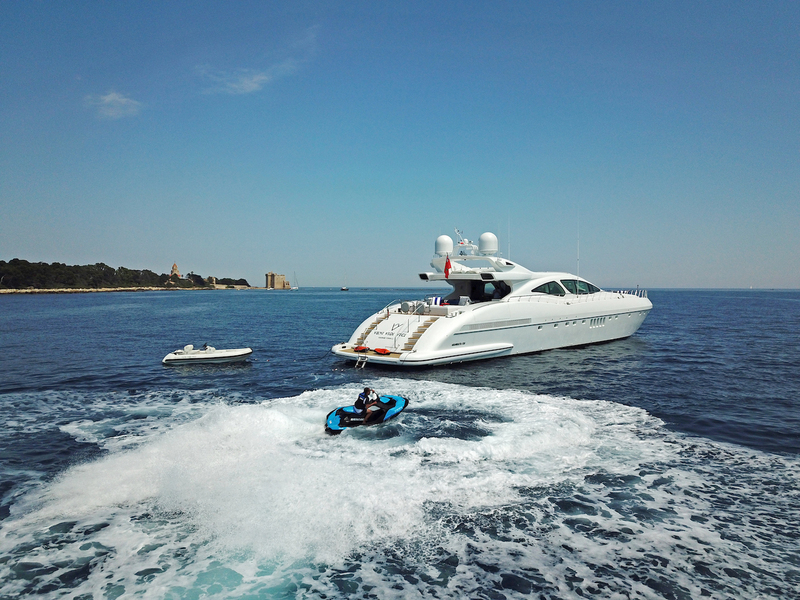 TENDERS & TOYS: ~ 16’ Castoldi tender ~ 2 seabob F5S quick starter ~ 1 Jet Ski Spark 2 seat ~ 1 Jet ski Spark Trixx ~ Paddles ~ Snorkelling equipment ~ Wakeboard ~ Waterskis AUDIO VISUAL EQUIPMENT AND DECK FACILITIES: ~ TV systems upgraded. 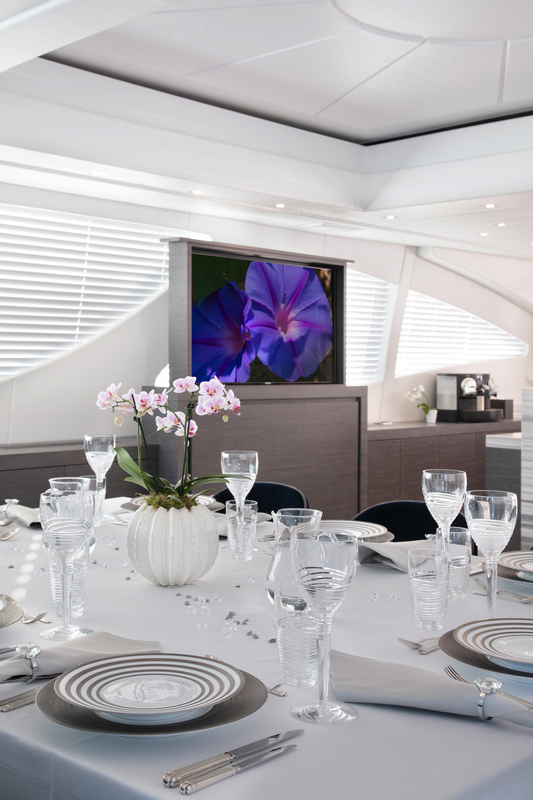 Airplay installed. 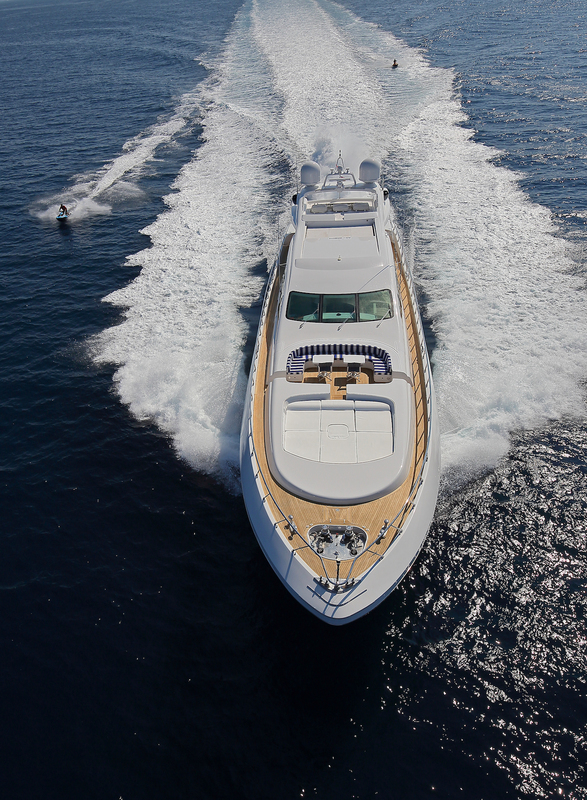 COMMUNICATIONS: ~ Internet via Sat. 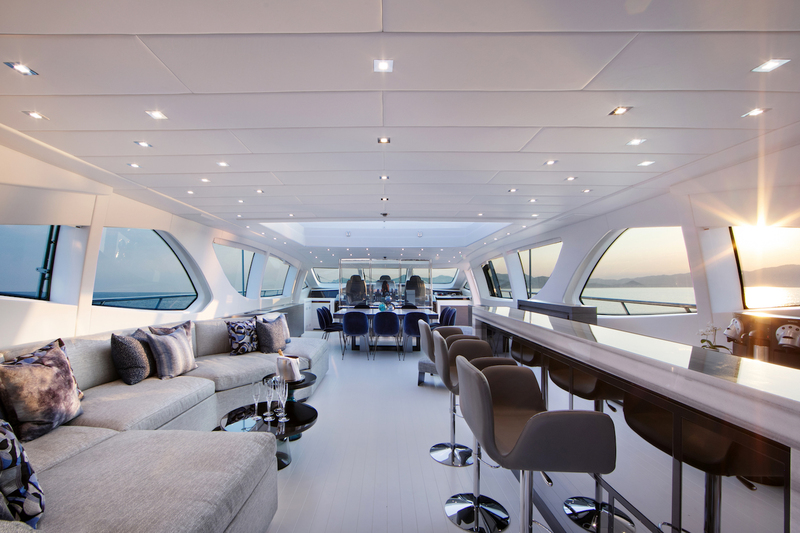 Wifi onboard.